The success of dishes such as soup and risotto depends to a great extent on the stock used. It will be so much better if you make your own stock from scratch rather than using a bouillon cube. 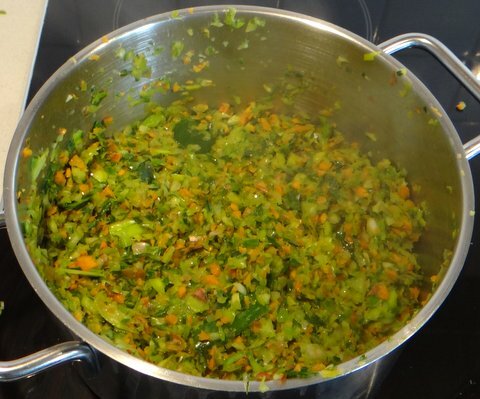 I was about to post a recipe that requires vegetable stock, and realized that I had not posted about how to make vegetable stock yet. So this one comes first, and the truffle, leek and shallot risotto will follow tomorrow. The nice thing is that you can make this for free if you save up vegetable scraps in the crisper of your refrigerator or in the freezer. It is also a good way to use up vegetable and herb leftovers that don’t look good enough to eat anymore but are not spoiled. A bit limp or discolored is fine for stock, as long as there is no mold and it still smells alright it should be fine. 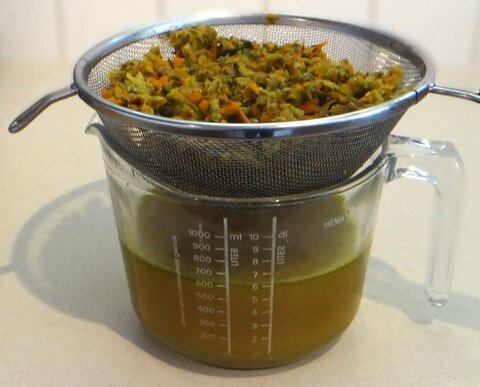 Use at least 500 grams of vegetable scraps for each liter of stock (or about a pound of vegetables for each quart), otherwise the stock will end up being watery. 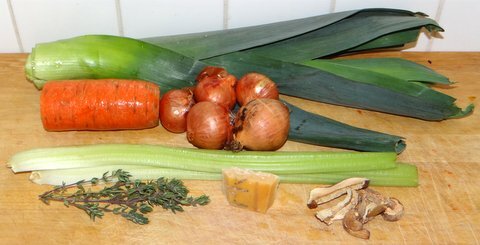 The basic vegetables for stock are onions, carrots and celery stalks. Members of the cabbage family (including broccoli and cauliflower) are not a good idea. There are also some vegetables that give a distinctive flavor (asparagus) or color (beetroot), so you probably only want to use those if you are making the stock for a dish that features that vegetable prominently. 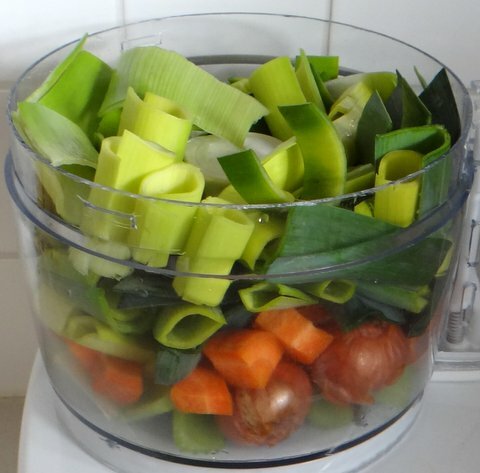 The nice thing about making stock is that you don’t need to peel the vegetables, you only have to wash them to remove any sand or dirt. Onions and shallots can go in with the skin! …and the food processor does the rest. 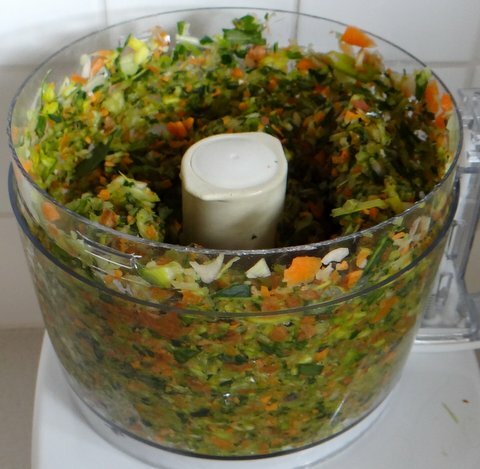 You can also use a knife and you will still get a nice stock if you don’t mince as fine, but the food processor can’t be beat. 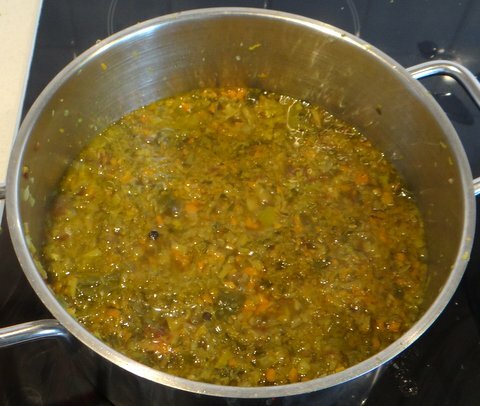 Then I let the minced vegetables sweat a bit in some olive oil over medium-high heat to enhance the flavors. When the vegetables are fragrant, add just enough water to cover. Add about 10-20% more water than the amount of stock you’d like to make. This is also a good time to add herbs, dried mushrooms, and some black peppercorns. As soon as it boils, cover and let simmer over low heat for 30-60 minutes. Longer will give your stock a ‘cooked’ flavor. Strain through a fine sieve. If you don’t mind the stock becoming a bit clouded (e.g. 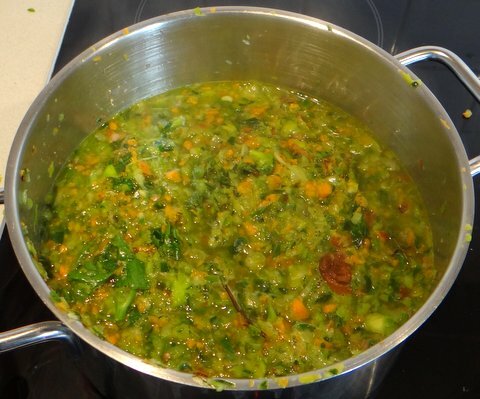 for risotto that doesn’t matter), press down on the vegetables to extract more stock. Use a cheese cloth if you want the stock to be clear. Your stock is now ready to be used. If you like you can add a bit of salt, but be very careful as in many preparations the stock will become more concentrated and thus may become too salty. If you’re not using the stock straight away, force cool (by putting the bowl in ice water and stirring) and keep in the refrigerator for a few days or in the freezer for months. Another good post Stefan. The truth of the post is at the start. If you want other good recipes to come out well, you must use good stock. With risotto, great stock = great risotto. Poor stock = why did I bother? Thanks Conor, can’t agree more! Hey Stefan, do you think it’s a good idea to reduce this stock after straining? I would like to freeze it in cubes in an ice tray. Hi Karol, that is a great idea as it reduces the space needed in your freezer. I do this all the time with different kinds of stock. Just remember that reducing it more slowly (simmering rather than a rolling boil) will keep more of the aromatics in your stock.